Sometimes, the best gift or artwork is the one that you make yourself. “Imperial Red” (shown above), “Lilies of the City”, “Silver Pendant Egg”, “Blue Bird of Happiness”, “Paradise Bird Egg” and “Metallic butterfly”. The Fabergé egg is considered a masterpiece of the art of jewellery, and is strongly associated with opulence and luxury. The original Fabergé eggs were made with precious metals and hard stones, decorated with enamel and gem stones. In total, 105 original Faberge Eggs were created by the Peter Carl Faberge and his assistants between 1885 and 1917. Today, only 69 are known to survive. Although Fabergé eggs are prominent in popular culture, appearing in TV and movies, not many people know that they originated in Russia, instead assuming by the name of jeweler Fabergé that they are French. 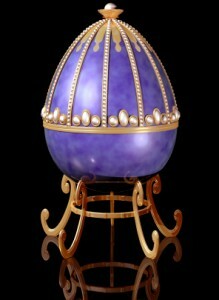 The story of the Fabergé egg began in Czarist Russia. As part of Easter celebrations in Russia (and other republics that follow the Orthodox church), there is a tradition to paint and decorate hens’ eggs. During Easter in 1885, the Czar Alexander III of commissioned the jeweler Peter Carl Fabergé to create the first Fabergé egg as gift to his wife Czarina Maria Fyodorovna to celebrate their 20th Wedding Anniversary, which also happened to fall in Easter. From the outside, this egg looked like a plain egg of white enameled gold, but it opened up to reveal a golden yolk inside. The yolk itself had a golden hen inside it, which in turn had a tiny crown with a ruby hanging inside, reminiscent of the Matryoshka nesting dolls. Empress Maria was so delighted by Fabergé’s jeweled egg that Czar Alexander appointed Fabergé to be a “Court Supplier” and commissioned an Easter gift each year thereafter, stipulating only that the jeweled egg it be unique and contain a surprise. His son, Nicholas II of Russia continued the tradition, annually presenting an egg each spring to his wife Alexandra Fyodorovna as well as his then-widowed mother. Twenty-four eggs were made and presented to Czars Alexander III and Nicholas II of Russia. A further two eggs were planned but not delivered, the Constellation and Karelian Birch eggs of 1917. The work was carried out by an entire team of artisans under Peter Carl Fabergé, among them Michael Perkhin, Henrik Wigström and Erik August Kollin. The Imperial eggs enjoyed uttermost fame and Fabergé made some 15 known eggs for just a few selected private clients, such as the Duchess of Marlborough, the Nobels, the Rothschilds and the Yusupovs. Among them is a series of 7 eggs made for the industrialist Alexander Kelch. In addition, 8 other jeweled eggs were also made, but they were not as extravagant as the Imperial eggs, and not as unique, often repeating designs that originated with the Imperial eggs. The original Fabergé eggs are tightly held and are seldom traded, so they are very hard to obtain. The last big purchase was made by the Russian Oligarch Viktor Vekselberg who purchased 20 eggs from the Malcolm Forbes collection for $120 million. The largest public collection is in the Kremlin Armory museum. The rest are in the hands of various other museums and private collectors in the USA, UK and Switzerland and Monaco. 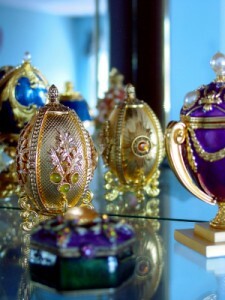 Due to their fame and originality, Fabergé eggs have been widely imitated by jewelers around the world. Although they are not the originals, they are nonetheless very beautiful. Many ornate and intricate designs have been created, and they are priced in reach of most collectors and admirers of fine jewelry.